The University Club is a restaurant operated by the Prive Group that is located in the Shaw Foundation Alumni House on Kent Ridge Drive. For those of you who are not so familiar with the area, it is situated at the southern fringe of the National University of Singapore grounds, just next to the NUSS Guild House. We had dinner there before and had a rather good experience. You can read about it here. Today, we were there for brunch. The University Club’s main customers are the university dons and staff as well as the occasional university social event. Most Saturdays are therefore quiet days and today is no exception. We had the place to ourselves and enjoyed the peace and the full attention from the service staff. There is a brunch menu as well as their regular set lunch menu. Although the latter usually kicks in for lunch after 12.00pm, they were flexible enough to commence lunch service at 11.30 as we wanted to try items from both the brunch and lunch menus. In addition to being flexible, the staff here are really professional and courteous. 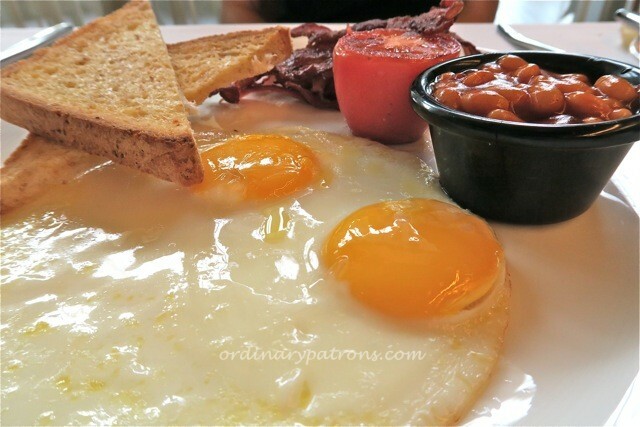 The brunch menu is quite simple and there are not many choices. 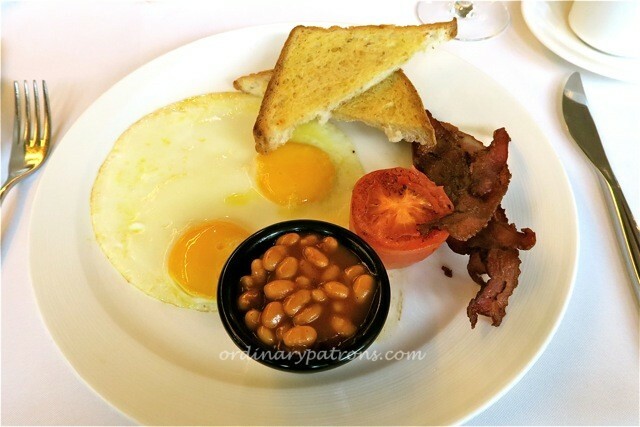 We chose the Jumbo Breakfast Platter ($16) which was made up of two eggs, homemade bacon, baked beans, roasted tomatoes and wholemeal toast. It does not score points for looks but it certainly has personality. We are not sure how the bacon is “homemade” but this one clearly tastes different. It was not as fatty as the usual ones but was super crispy and fragrant (in a bacon-like way). The bacon added an extra dimension to the other items which, while competently done, were not that special by themselves. For lunch you have a choice of a two-course ($25) or three-course lunch ($28). There are seven types of starters, main courses and desserts to choose from, so there is quite a large number of permutations available for lunch. For starter, we had the Prawn Fritters. Three large prawns were lightly deep-fried and served with cubes of cantaloupe and garnished with pomegranate and passion fruit mayonnaise. Mixing fried seafood with sweet fruits is unusual, but it did work out well. The prawns were firm and cooked just right. The fruits added a refreshing accompaniment. Our main course was the Pork Belly Linguine Napolitana. This was a more conventional dish. 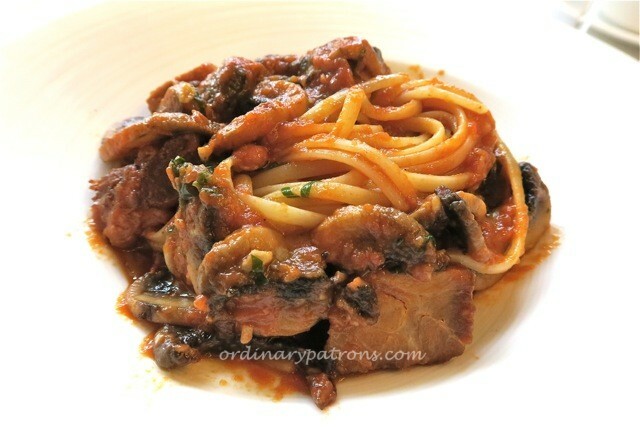 The linguine was served with pork belly cubes and mushrooms in a tomato-based sauce. In terms of appearance it did not look like a big serving but it certainly felt heavier than it looks and the pork probably added to the heaviness which we felt after eating it. It was a well cooked dish but without a wow factor. We would certainly recommend this dish for those with a good appetite. That was all the space we had, so no desserts this time. All in all, it was a pleasant brunch on a cool, lazy Saturday morning.